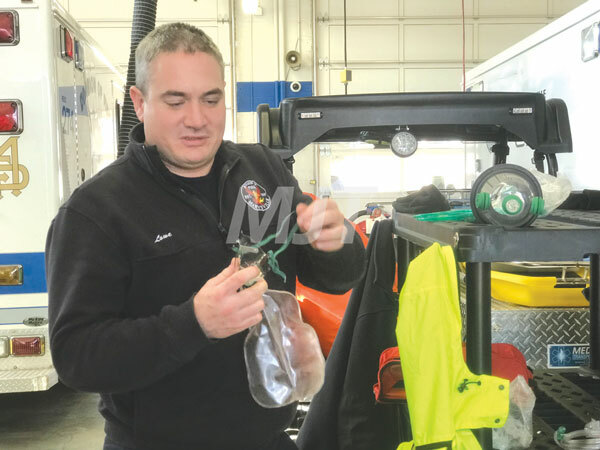 Marysville Firefighter Rusty Lowe demonstrates an oxygen mask specially designed for animals. Local EMS agencies have received both training and equipment to help them rescue animals in danger. Last month’s rescue of a dog from an icy pond on Dog Leg Road is something local authorities might not see often, but Marysville Fire Chief Jay Riley said they’re always ready to save animals. Riley said there are challenges to when animals need rescued. He said in those situations, the animal is often scared. “We don’t want to get injured, but we do want to care for the animal,” Riley said. Riley recounted one instance years ago when a horse got stuck straddling a partition inside a transport trailer. The partition was five feet tall, and cutting into the horse’s abdomen. Crews were able to rescue it by raising its hind legs until it could get over the partition. “We do have those strange, occasional calls that come through,” Riley said. Smaller critters also often see local authorities give a helping hand. According to Riley, animals that get into storm sewers are typically smaller animals like cats. “They’ll crawl in the pipes, and then somebody might hear them,” Riley said. In these sorts of cases, Riley said crews will sometimes have to get creative. “We take the manhole covers off, we try to use all the resources the city has to try to clear the animal out,” Riley said. Riley joked the fire department does also occasionally get called to get a cat out of a tree. Riley said the team that went down to North Carolina to assist with last year’s hurricane rescues got large animal rescue training from The Ohio State University Large Animal Vet next door to Decker Fire Station on County Home Road. The training included administering medicine to calm animals, and how to safely work around large animals, and how to lift them if needed. “We’re able to go in there an mitigate that, and calm the animal,” Riley. Dr. Martee Masterson, of the OSU Large Animal Vet, said saving large animals comes with it’s own challenges. The biggest hurdle is moving a large animal, according to Masterson. “They’re just so much bigger, you’re going to have to have a tractor or some piece of equipment to move an animal that weighs a thousand pounds,” she said. That’s complicated if an animal is stuck on an icy lake, since the equipment needed to move the animal is typically as heavy, or heavier, than the animal itself. “You can’t get a tractor out on the ice, so you need a long enough chain or bucket,” Masterson said. Masterson said horses stuck on ice will sometimes get discouraged after several attempts to stand up. Even after crews get them on solid footing, the horse will still be convinced it can’t get up. One unusual challenge stems from warming the animal up. She said animals have to be warmed from the inside out. “Putting heaters on them, putting them in a warm water bath is not necessarily the best way to warm them up,” she said. Those methods dilate blood vessels in an animal’s limbs. Masterson said instead, animals should be warmed with IV fluids or sometimes oral fluids. “We really need to centralize all that blood flow to the important organs, like their heart, their brain, their kidneys,” she said. That training could also come in handy in the future. Riley said local EMS crews will attempt to save any animal, whether it be pet or livestock. “We would sure try,” Riley said. Riley also noted that several local firefighters were raised on farms, so they’re used to being around large animals. “It’s really beneficial to have those people and use their expertise from home,” Riley said.